Bit of a misfield but in the scorebook it simply said 4 runs. Sadly he didn’t add to that total, but he was perfectly at home in this elevated company, and who knows what he will accomplish next season when he is actually in the correct age group at under 13s. My sister decided she wanted to get rid of another hot tub, so it ended up in our garden. These things take ages to actually get anything above lukewarm, and with torrential rain either side of one solitary mild day it was a challenge. This was several weeks ago – and it was hot for about 12 hours. After a quick dip the boys have been nowhere near it – and it is now freezing as we await a heatwave. Sapphire is getting a little bigger these days, as are his kills. Rabbits, birds, squirrels, and some things that are of indeterminate origin such is the extent of their mutilation. The driveway has become something of a slaughterhouse, with a beheaded bird acting as a warning to all creatures great and small. I’m off to Washington DC next month, with a flying visit to the Microsoft WPC in Toronto thrown in. I used to head for DC quite often, and the flights plus hotel was always around £1200. This time, however, it was around £1700, so I did another search. I stumbled across the same journey flying business class rather than economy for an additional £200. So although it will be a bit of a whistle stop tour at least there will be a bit of luxury attached to it! Back to cricket, and Whaley Bridge Under 17s overcame a young but spirited Hazel Grove side to reach the Compstall Cup semi final. The semi will take place on Thursday next week, coincidentally against Compstall, and we are hoping for a warm night and a good crowd. Had a busy day a couple of weeks ago, starting with the latest breakfast meeting of High Peak Business Club. Edwina Currie was looking resplendent as usual, but perhaps not as resplendent as Sally and myself who were off to the races immediately afterwards. Anyway, Edwina didn’t miss a trick, insisting on her two best dressed individuals appearing on the promo pic with the chap from Barclays, but you will have to wait for the next edition to see that. So we set off for York where Elements Legacy, very partially owned by Sally, was running in the 3.10. The journey itself was not without incident, starting with a text message from Ole’s maths teacher. It said that she had sent an email and we should read it asap. A worrying sign, so I logged on to my email but there was nothing. I texted her, but the wonders of Aquinas meant that I could not reply to her message. I rang Ole and he had no idea what it was about (of course), so we spent the rest of the day wondering. That incident was quickly forgotten as we got a call from Chapel School letting us know that Zac was marked as absent. Apparently the bus had broken down, but as is usual in these circumstances, one of the other buses was sent back to pick up the remaining passengers. Zac, however, simply couldn’t wait. Perhaps sensing an opportunity with his parents on their way out for the day, he quickly returned home. He must have heard the shouts of the other pupils as the replacement bus arrived, but when he is determined he is quite capable of cutting out all other distractions, including school. I rang home and Ole answered, confirming that Zac had made it safely home. That wasn’t the point, so I told Zac he must get to the service bus stop and get to school on his own. Job done. Or maybe not. An hour later a text came through confirming that Zac had not yet made it in. I rang home again and again it was Ole who answered. Zac had gone to the bus stop but the bus didn’t stop. Zac returned home whereupon Ole told him he had to stick his hand out. Another hour later and Zac finally made it to school. And its ok, because when he came home he confirmed that he hadn’t really missed anything worthwhile! So we arrived at York, where we were ushered into the owners car park, and we headed for the owners lounge. Sally decided on Prosecco whilst I opted for coffee, and no sooner had we sat down than Sally was called into action. The girl serving coffee had keeled over and needed medical attention. Sally rushed straight to her, administering little more than TLC, but by the time St Johns Ambulance arrived the girl was back at her station. The staff fussed around Lady M, and she whispered to me that they told her that whenever she goes to the bar she should just give the head steward a nod and she wouldn’t have to queue. I spotted a flaw in that plan, she would have had no intention of queuing at the bar that day or any other day. Thats my job! 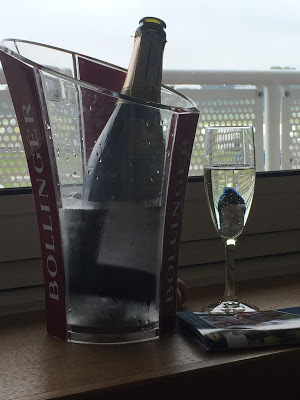 We met some interesting people in the Owners & Trainers bar, including trainer Ann Duffield, and we renewed acquaintances with racing legend Mick Easterby who was as charming as ever. Of course, something had to spoil the day, and that something was Elements Legacy. It set off second last, and quickly dropped back to last. It was hard ridden throughout, and only managed to pass two horses near the finish as they had clearly given up. It wants further, claimed the trainer, so I look forward to seeing it in the Grand National! Later on it was the football presentation evening, and followers of this blog will know that it has been a successful year. The evening traditionally starts off with a game of heads & tails, and one year Zac actually won it. Things get a bit more difficult for him though, as people have cottoned on to the fact that he sometimes bends the rules, or to put it another way, blatantly cheats. This year his pals overheard him telling Archie Hambleton that its pretty easy to cheat in the early rounds, but when you get close to the prize and you have to get up on stage it is more difficult. Anyway, he got rumbled straight away, and his buddies grassed him up, shouting ‘cheat cheat cheat’ until he admitted defeat. Somehow I don’t think that it will deter him. It turns out that the firsts want me to play cricket for them. Haha! This is the same first team whose captain disappeared two days before a game and left the team short. The same first team whose vice captain wouldn’t play on Saturday because he was going away on Sunday. The same first team who said that availabilities would be better this year. They knew they were short on Thursday. They rang me on Saturday morning, 2 hours before the game. I politely declined their offer. I could go on, but I won’t. Anyway, we got rained off! And still on cricket, my declining form continued against Birch Vale when I was caught for just 5. It could have been embarrassing but our captain and Ole took us from 73-4 to 221-4, with Ole getting his maiden 50, finishing on 83 not out. At £1 a run he then struggled to figure out how much that would reduce the cost of his Leeds Festival ticket in our incentive scheme. That’s maths A level for you. Sally and Helen went to a Decorative Home & Salvage Show at Tatton Park. 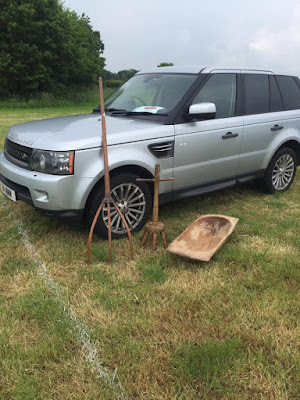 It does not take a genius to figure out that they would return with a pile of tat, and that is exactly what they did (see below – Range Rover not included). The wooden shite bemused even myself, and I am used to being asked to scour the darker reaches of northern towns in the quest for obscure items purchased for the sole reason that they appeared to be a bargain on eBay. You have to realise that in transactions such as these ‘need’ doesn’t come into it. In fact, in most cases ‘want’ doesn’t come into it either. ‘Bargain’ is all that it takes. The giant fork has still not got a home, despite being tried in several positions throughout the house. The ‘trug’ as the flat piece of wooden junk is called, was originally meant to hold champagne (WTF?) but so far it has not managed a drop. Instead, guess where it is? Bearing in mind that it is made of wood? Still not got it? Its on the hearth. Bit of a fire risk? Maybe. It is also filled with candles. I give up! I also tried pulled pork. Sally was somewhat critical of the detailed preparation and massaging of the meat, but it didn’t last long when it was served up. That will definitely be repeated. Next up was sweet chilli chicken. Here’s a strange one – I looked for a recipe for this, and most of them, including offerings from well known chefs, gave instructions on how to marinade chicken followed by ‘serve with sweet chilli sauce’. Some even suggested using Amoy or other well known brands. Eventually I figured it our for myself, and ended up with a very piquant, sweet and spicy syrup. Perhaps there was a little too much white wine vinegar, perhaps it needs watering down a bit. Anyway, after a few days the sauce began to mature, and it was soon consumed. I will experiment again, and the finished article will definitely appear in Mmm…No2…Cookbook, the imaginatively titled sequel to Mmm…No1…Cookbook. And speaking of which, I finally got around to writing a few more pages at the weekend. With an upcoming trip to the states I may even get to finish it, along with The History Of Zombies that was also resurrected this week. Last weekend Sally and Ole were up at the cricket ground in my car, with Ole getting driving lessons from his mum. Later in the week I sensed something strange, and realised that the driver’s side car mat was missing. I then started a text conversation with Sally. Saturday afternoon and I’m about to head home after cricket. Sally called and told me to make sure the hedgehog is ok before I joined her at the barbeque we were heading for. Hedgehog? And then a ridiculous tale unfolded. 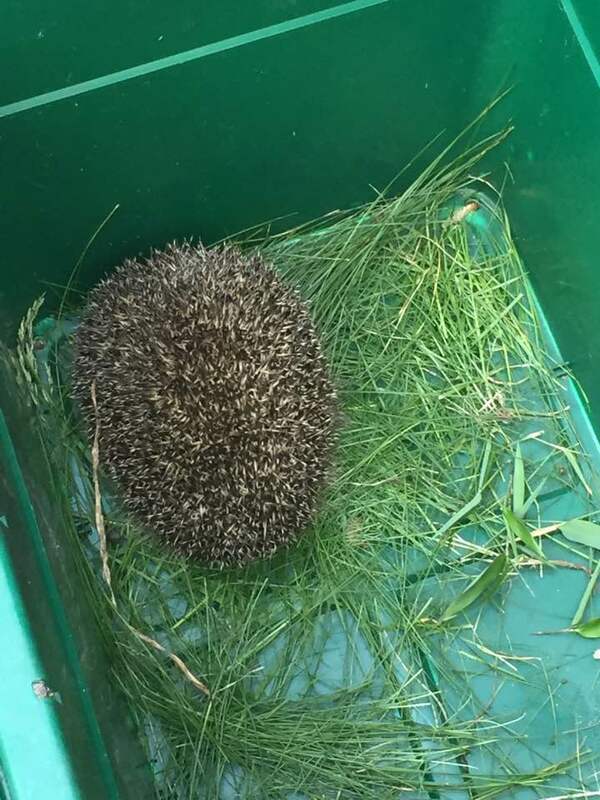 Another of the bbq guests had seen a hedgehog outside her house in Chinley. It clearly needed rescuing so rather than phone the RSPCA she posted it on Facebook. Sally read the post and immediately volunteered to fetch it. Her reason was simply that the boys had never seen a live hedgehog before, but hold that thought! She told me they eat cat food (the hedgehog, not the boys) – but from my recollection as a child it was always milk and bread. 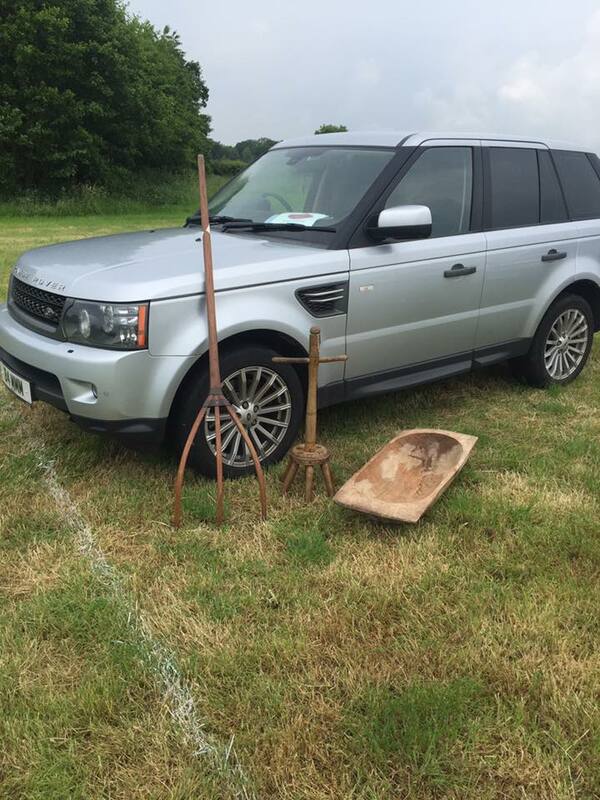 Anyway, she went on her way to pick it up, complete with large green plastic box and gardening gloves. Helen met her and they scooped up the hog, adding some cut grass to make it feel at home. Inside the house, the young daughter was a little puzzled about the rescuer, expecting a ranger or vet of some sort with appropriate overalls and wellington boots. She was quite excited and told her mummy exactly why. ‘The hedgehog rescuer is wearing high heels and red lipstick’. Little did she know that the rescuer was heading for the same party as her mummy. So, they got it home but it had not moved a jot. Helen, being a bit more of a country gal than the lipstick wearing Sally, donned the gloves, picked it up, turned it over and prodded it. 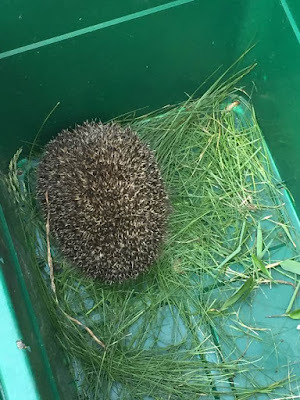 ‘Rigormortis’ she announced somewhat professionally, and the clearly dead hedgehog was then returned to its grassy box and left outside the house. I returned home with Ole, and we peered at the hog, unaware that it had gone to meet its maker. There was no movement, so I texted Sally enquiring as to its condition. ‘Dead as a dodo’ she announced, admitting that she had only left it there to see if I fed it some cat food! The whole scene would not have been out of place in a Monty Python sketch. Here’s an excuse to show an adorable picture as Pixie is taking after her grandpops in the kitchen! Last Friday saw the second run of Elements Legacy in a race at Redcar. Bit too far to go so we watched it on a laptop. The horse ran considerably better, breaking well and staying in touch until fading in the final furlong. He finished 4th of 6, but was much closer at the finish. The trainer is convinced they will find a race for it before the season is out! Sally bought a multi use garden implement around 12 months ago. It never worked, but a couple of weeks ago she took it to a lawnmower repair man who said he could get the brush, strimmer, chainsaw, etc, etc, working. So he did. Last weekend Sally spent several hours trying to get the brush attachment to work. It did, for a while. Then she tried the strimmer. It kept cutting out. She has now traded the whole thing in for a top of the range strimmer. We never did get the chainsaw to work! I’m at that age where a lot of my lady friends have become hormonal, as evidenced by the ridiculous shopping trip above. They freely admit that their minds are everywhere but where they should be. Of course, I have every sympathy with them. No sooner do they get rid of the irrational behaviour brought on at the ‘wrong time of the month’ during which they could cheerfully kill their beloved for leaving the toilet seat up, than they have to endure even more dramatic mood swings that last for months or even years. This week is election week, and the polls indicate that the result is very close. If I assume that 50% of the electorate are women, and at any point in time at least 25% of them are murderous, vindictive, unbalanced individuals, given that the election is likely to be decided by a margin of less than 10% do we need to reconsider the Equal Franchise Act of 1928 and the Representation Of The People Act 1918? Sunday was a special day. Gabi and Pixie had already given me cards and a gift. Sally had ensured that the boys did likewise. Then she got a bit over excited. ‘Quick. Log on to Facebook and see how many birthday messages you have’. Happy Fathers Day!